Until recently, Ukraine seemed to be leaning westwards to a more open and democratic style of government, but following the reversal of a reform that curbed presidential powers, there is a sense that the country is being drawn to eastwards. She is made from a massive slab of stainless steel and stands 62m (200ft) high. She holds up a sword and a shield emblazoned with the hammer and sickle, and stretches skywards watching over the Ukrainian capital, Kiev. 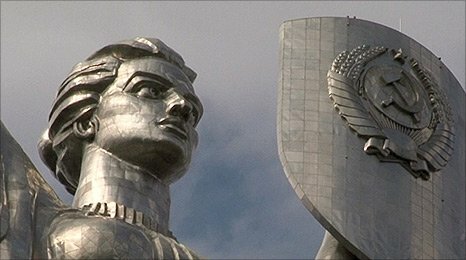 They call her Mother of the Motherland, built symbolically to defend the Soviet Union from an encroaching Western Europe. Unlike similar statues in many other former Soviet countries, this statue has not been pulled down. Instead, she has come to represent the new-looming influence of Russia. "See that?" said an American tourist. He pointed to the top of the statue, brought his hand rapidly down to the base, then lifted it up again, then down again. "Nowadays they call it Vertical Power." "They call it what?" I asked. "Or Power Vertical," he answered. "Check it out." Caught in a rainstorm, Oleg Rybuchuk, who runs a think tank, arrived late for our meeting. As soon as we sat down, I asked what was meant by Power Vertical and whether it formed part of the government's policy. He laughed. "It means you have the biggest boss and he gives a command and it goes through like blood in arteries and reaches everywhere." "Is it good or bad?" I asked. "What's the opposite - Power Horizontal?" "Neither is good," he said quietly, his smile fading. "But the opposite, we call chaos." He was referring to the post-Soviet period, particularly the years after mass protests in 2004, hailed as the Orange Revolution, that threw out apparatchik politicians and ushered in reformists who were meant to forge a path towards European Union membership. It was yet another notch, many analysts thought, on the scoreboard for Western democracy. But it did not work out like that and earlier this year conservative politicians were voted back into government. According to critics, they have been bolstering their own power and moving against activists and the media. In Brussels, that nerve centre of the European Union, there has been much talk that Ukraine might now never become a member, that it is turning its back on the West and taking a lead from the new authoritarian Russia - from where, according to Google, the phrase "Power Vertical" first emerged. "Ukrainians don't believe anymore in fairytales," said Walid Arfush, who was among the Orange Revolution demonstrators. He became disillusioned, switched sides and is now the deputy head of the government-controlled television station. "We never had democracy here, only something that looked like democracy that the foreign newspapers wrote about. "The only thing Ukrainians worry about is how can I pay my bills, how can I afford schooling for my kids." Less than an hour's drive from Kiev, I came upon a scene that far from resembling an emerging European economy, was more suited to the pages of novel by Leo Tolstoy. It was a product - as Tolstoy wrote - of the storm-tossed sea of European history. A young man, in ragged clothes, his face creased with work and the weather, lifted a load of hay onto his back. Bent double, an almost Biblical figure, he carried it to a barn where his mother was gathering cows in a pen. His name was Volodymyr Petrovych. He was 10 when the Soviet Union collapsed and today was celebrating his 31st birthday. The farm used to be a Soviet co-operative, rows of once magnificent whitewashed buildings, now run down and broken, with stray dogs running through the grounds. Not surprisingly, Volodymyr had not heard of Power Vertical, nor was he much interested. "The trouble is there's no difference between politicians," he grumbled, bundling up another load of hay. "They're always fighting each other. Politics is politics. But here is real life." "Ukraine used to be part of the Soviet Union, you know," chipped in his mother. "Then our wages went three times further." "So, what do you want for your birthday?" I asked Volodymyr. He stood upright and brushed dirt off his hands. "I need a horse to carry these loads. But we can't afford one." Back in Kiev, I met a deputy prime minister, veteran conservative politician Borys Kolesnikov. I told him about Volodymyr's need for a horse. "That's what we really have to sort out," he answered. "Wages. This is our biggest challenge." "Will you do that with Power Vertical?" I asked. He chuckled. "Our opponents make an issue of this, but the meaning is very simple. It means that decisions taken by the president are carried out. That's all." "But people say it means curtailing freedoms, turning away from Europe and leaning towards Moscow," I say. "No," he countered, fixing me with an iron gaze. "You tell me about the farmer who needs a horse. "Real freedom comes when there is freedom of the economy, so this Power Vertical is not Russia or Europe or democracy or anything. It's just making things work." Russian President Vladimir Putin (R) shakes hands with his Ukrainian counterpart Viktor Yanukovich during their meeting at the Zavidova residence in the Tver region March 4, 2013. Ukraine just made what geopolitical expert James Sherr called "a civizational choice": On the table sat an Association Agreement and trade pact with the EU — an open invitation to integration with the West — as well as a Russian offer to join the Belarus-Kazakhstan-Russia customs union. Last month John Lloyd of Reuters wrote that if the Ukraine signed the EU pact, "a major state will move into the West's sphere of influence." That didn't happen. Ukraine has chosen to decline the EU's offer after Russia imposed trade sanctions on the Ukraine and threatened other economic consequences if Kiev signed the deal. [Ukraine President Viktor] Yanukovich's prime minister issued the dramatic order to suspend the process in the interests of "national security" and renew "active dialogue" with Moscow. EU officials, who had hoped the president's complaints in recent days were a last-minute bargaining tactic, saw little chance of saving the deal. The result is that the Ukraine stays in the "Slavic-Orthodox cultural bloc" that includes much of the former Soviet Union and parts of East-Central Europe. ... without Ukraine, the EU's Eastern Partnership program, a push to strengthen ties with former Soviet territories, would come under further question. Armenia, which had been expected to sign a deal with the EU, abruptly changed course in September and announced it was aligning with Russia instead. Georgia and Moldova are still expected to initial agreements with the EU in Vilnius, but Ukraine is by far the largest economy targeted by the EU program. "The result is that the Ukraine stays in the "Slavic-Orthodox cultural bloc" that includes much of the former Soviet Union and parts of East-Central Europe." Again the cultural meme of Western/Eastern antagonism going back a thousand years, when Communism is a Western product/heresy. This helps the revolutionary dialectic of the Kremlin and in Kiev, so they can divide their opponents. This is pretty important news yet I doubt we'll hear anything about it in the MSM. Thousands of Ukrainians, opposed to President Viktor Yanukovych’s decision to abandon a trade agreement with the European Union, hurled stones, Molotov cocktails and chunks of pavement at a line of black-clad riot police in the centre of Kiev Sunday. The police fought back with baton charges and volleys of tear gas. Editorial Is Ukraine getting back in the USSR? But this was far more than a street fight, or even a political protest. Bankova Street in Kiev – the road outside the presidential administration building – was the front line in an increasingly acrimonious struggle between the West and Russia over Ukraine’s future as both a market and a sovereign nation. The riot police were holding a line drawn not by Mr. Yanukovych, but by Russian President Vladimir Putin, who is intent on making sure that it is Moscow – not Brussels or Washington – that makes the rules in Ukraine, the most populous and strategically important of the territories Russia lost when the Soviet Union collapsed 22 years ago this month. In the Kremlin’s narrative, the past two decades have seen relentless Western advances toward its border, with the EU – often followed by NATO – expanding first into the former Communist states of Eastern Europe, now into what was once the USSR. Russia, which has never been invited to join either organization, has decided enough is enough. At least 100,000 protesters – some estimates put the crowd at several times that size – defied a ban to rally in the centre of Kiev on Sunday, brought into the streets by anger at Mr. Yanukovych’s abandonment of the EU trade deal, and the use of force by riot police to clear a small protest camp early Saturday. Sunday’s protest was the largest in 11 days of demonstrations in Kiev and several other Ukrainian cities against Mr. Yanukovych’s government. It also appeared to be the biggest protest to hit the country since the Orange Revolution of 2004 brought pro-Western politicians to power. Mr. Yanukovych, the loser of that power struggle nine years ago, was in full retreat mode again this weekend, saying he was “deeply outraged” over the use of force by police on Saturday, and claiming that he still sought an agreement with the EU, perhaps a tripartite one that also included Russia. There’s only so much ground Mr. Yanukovych can concede. Ukrainian officials have admitted that they withdrew from the hard-won EU deal because of the threat of economic punishment from Russia, which buys nearly a quarter of the country’s exports and supplies the natural gas that powers Ukraine’s economy. Some in Russia say that the battle for Ukraine is about far more than trade. A Ukraine that moves closer to the EU – at Russia’s expense – would be a fatal blow to Mr. Putin’s dream of restoring Moscow’s influence over the territory of the ex-USSR. In luring Mr. Yanukovych away from the EU, Mr. Putin’s rival trade bloc, the Eurasian Union – which is due to come into existence in 2015, with Russia, Belarus, Kazakhstan, Armenia and now likely Ukraine as members – suddenly looks much more formidable. Ukraine itself is deeply and angrily split between the west of the country – which is predominantly Ukrainian-speaking and aspires to integration with the EU – and the Russified east, which supports Mr. Yanukovych and closer ties with Moscow. Many among the massive protest in Kiev were students from the west of the country, who had journeyed from cities like Lviv and Ivano-Frankivsk to lend their weight to the tug-of-war over their country’s future. The crowd on Sunday was so big it was, at times, difficult to control. While political leaders like boxing champion Vitali Klitschko and business magnate Petro Poroshenko called for the protesters to stay peaceful and join a general strike this week, breakaway factions took over Kiev city council building – spray-paining “headquarters of the revolution” on the outside – and besieged the presidential administration building. There was confusion over who was directing those who battled the riot police on Bankova Street. Mr. Poroshenko and others claimed they were “provocateurs” hired to encourage the police into a bloody crackdown on the main protest. At one point, a tractor was driven into the lines of riot police in front of the presidential administration building. About 100 people – police and protesters – were reportedly injured in the clashes. “We again have no plan what to do, and how to do it, and what to do if we win,” said Nina Sorokopud, a veteran of the 2004 protests who was on the streets of Kiev Sunday. She bemoaned the fact that former prime minister Yulia Tymoshenko, one of the main leaders of the Orange Revolution, had been jailed by Mr. Yanukovych in 2011 on charges many see as politically motivated. The split in Ukrainian society was on display Sunday even in Moscow, where a lone protester stood outside the Ukrainian cultural centre on the Arbat pedestrian mall, holding a handmade Ukrainian flag with “Ukraine is Europe” written on it. “We are situated in Europe. We want to live in a modern country, with good education and good health care. We want the rule of law,” explained Darya Bondarchuk, ignoring the occasionally rude comments of Russian passersby. The 24-year-old said she had come to Moscow to study economics at the People’s Friendship University. Two Russian-speaking Ukrainian women confronted Ms. Bondarchuk abut her sign. “Where are you from?” they challenged her. When Ms. Bondarchuk told them she was from Lviv, a predominantly Ukrainian-speaking city near the border with Poland, the older women harrumphed. Ms. Bondarchuk smiled at the two women and continued her lonely protest. In the biggest demonstration yet after weeks of growing momentum, hundreds of thousands of Ukrainians filled the streets of Kiev on Sunday, tearing down and breaking up a monument to Lenin in the city center and intensifying their outcry over President Viktor F. Yanukovich’s turn away from Europe. Carrying blue-and-yellow Ukrainian and European Union flags, the teeming crowd here filled Independence Square, which has been transformed by a vast and growing tent encampment, and where demonstrators have occupied public buildings, including City Hall. “Resignation! Resignation!” members of the crowd chanted, reiterating their call for the ouster of Mr. Yanukovich and the government led by Prime Minister Mykola Azarov. Thousands more people gathered in other cities across the country. The giant rally reflected just how deeply roiled this nation of 46 million people has become in the weeks since Mr. Yanukovich said he would not complete political and free-trade agreements with the European Union that he had been promising to sign for more than a year. With Western governments urging a peaceful and lawful solution, but no indication of any possibility of a compromise, the continuing unrest seemed likely to confront Mr. Yanukovich with several unpalatable choices, including a crackdown by security officers that many demonstrators say they fear but believe was inevitable. The president could wait, hoping that increasingly cold weather and demoralization will eventually thin the crowds, but the continuing occupation of a large swath of the capital has already added a patina of weakness and indecision to the government’s growing unpopularity. Heightening the tension is a severe and urgent economic crisis, along with Ukraine’s need to secure a financial aid package worth $18 billion or more. At the moment, that help seems most likely to come from Russia, but any agreement with the Kremlin is likely to spur further public fury. Many Ukrainians view the accords with the European Union as crucial to a brighter future, with Western-style rule of law that could combat what many view as deeply entrenched public corruption and cronyism among the country’s wealthy elite. They also see the agreements as eventually offering better economic opportunities. The accords were also viewed as a way to break free of the grip of Russia, which nearly a quarter-century after the collapse of the Soviet Union continues to exert heavy sway here, including complete control over Ukraine’s natural crucial gas supply. Mr. Yanukovich’s comments that in retreating from Europe, he planned to restore relations with Russia — where he met on Friday with President Vladimir V. Putin — have only further inflamed the crowds. On Sunday, the sky over Kiev was gray, but temperatures were comfortably above freezing. The demonstrators were old and young and middle-aged, from Lviv in the west to Odessa in the south, and from Dnipropetrovsk in the east to the country’s heart, Kiev itself. Parents held children onto their shoulders, students wore blue-and-yellow striped face paint, and volunteers handed out steaming cups of tea and other refreshments. They sang the national anthem and were blessed from the stage by representatives of all of branches of the Ukrainian Orthodox Church, save for the Moscow Patriarchate, which is loyal to Russia. The protest movement accelerated drastically after a violent and ill-conceived crackdown by the riot police on a small group of demonstrators more than a week ago. Scenes of young protesters being beaten and bloodied with truncheons, some as they lay on the ground offering no resistance, enraged a country that views itself as inherently peaceful. Many commentators noted that there had been no such violent outbreak during the Orange Revolution of 2004, when hundreds of thousands of people similarly took to the streets to protest, and ultimately reverse, the results of a fraudulent presidential election. Indeed, many protesters on Sunday said it was that display of violence, more than the rejection of the accords with Europe, that had motivated them to protest. Mr. Yanukovich, who insists that he is acting in the best economic interests of Ukraine, has been planning to seek re-election for another five-year term in 2015, but seems to face an increasingly uphill battle. Brushing aside the initial demonstrations, he issued terse criticism of the police violence, but promptly left Ukraine for a state visit to China, followed by a stop in Russia to visit with Mr. Putin. In both cases, he seemed to be seeking economic assistance. In a speech to the crowd, Vitali Klitschko, the champion boxer who leads the opposition Udar party, recounted the demands of protest leaders, including the dismissal of Mr. Azarov and the government, followed by new elections, the release of more than a dozen protesters who had been arrested in recent days and punishment for police officials responsible for the violence. Oleg Tyagnibok, the leader of the nationalist Svoboda party, denounced the government, and repeated a widespread belief among demonstrators that Mr. Yanukovich was negotiating with Mr. Putin over joining the regional trade bloc that the Kremlin has been pushing as an alternative to Ukraine’s forging closer ties with Europe. The Ukrainian and Russian governments have forcefully denied that there was even any discussion of the customs union between Mr. Yanukovich and Mr. Putin in Sochi on Friday. They say they were moving forward on other broad agreements involving trade and energy issues, but did not sign anything. Arseniy P. Yatsenyuk, the leader in Parliament of the opposition Fatherland party, said that only the demonstrations had prevented Mr. Yanukovich from signing an agreement to join the trading group, which would include Belarus and Kazakhstan. “Yanukovich was afraid to sign the agreement with Putin,” Mr. Yatsenyuk said. Ksenia Smernova, 26, a bartender living in Kiev, wore a plastic wreath shaped as black currants and wildflowers, which she said represented the forests of western Ukraine. Ms. Smernova said that she supported the European trade deal but came out to protest regularly only after the televised beatings by the riot police, called the Berkut. “I came out on the 24th just to support this agreement, but then I started to come out to protest against Yanukovich and the government,” she said. "tearing down and breaking up a monument to Lenin"
The protestors, they know what's really going on, even if the West does not. Well, looks to me like it isn't everyone in the Ukraine. In fact, the people are sorely pissed. I saw videos of them ripping down a statue of Lenin this morning and rioting. They were chanting that the President of Ukraine was "NEXT". 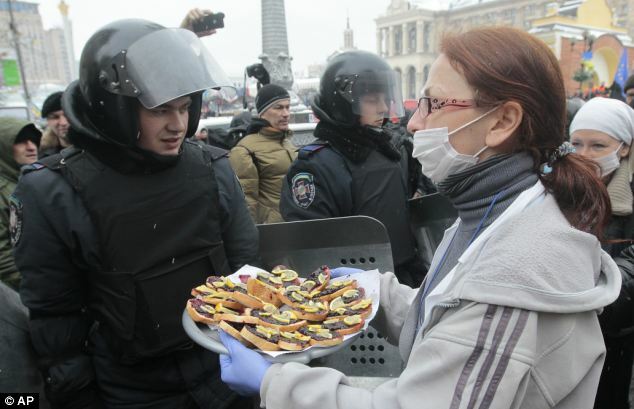 A Pro-European Union activist tries to give food to riot police officers preparing to block the Independence Square in KIev, Ukraine, Monday, Dec. 9, 2013. 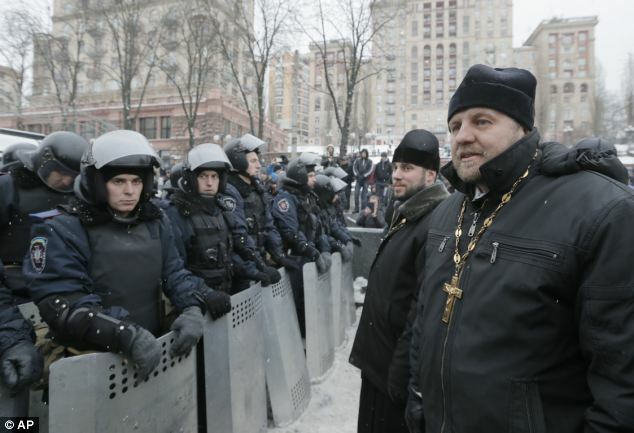 The policemen, wearing helmets and holding shields, formed a chain across Kiev’s main street outside the city building. Organizers called on protesters to vacate the city hall and the other building which the opposition had used as its headquarters. 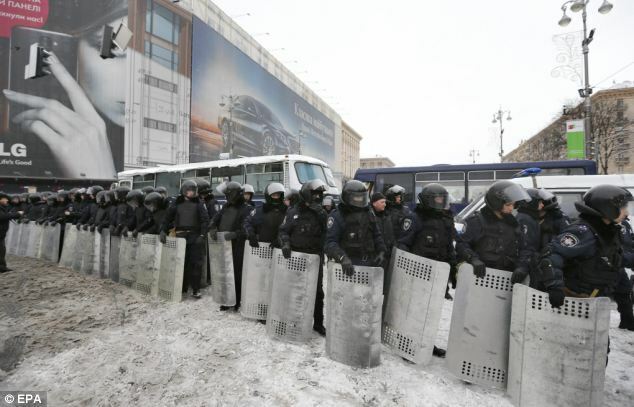 KIEV, Ukraine (AP) — Ukrainian police in full riot gear have encircled tents and barricades erected by anti-government protesters that are blocking city buildings in Kiev and have begun to dismantle some of them. The police action involved at least two protest sites outside government buildings in the center of the Ukrainian capital. The appearance of the riot police earlier Monday had raised fears of a possible violent police crackdown against the protesters. President Viktor Yanukovych has faced three weeks of angry protests after his decision to freeze ties with the 28-nation European Union and turn toward Russia instead. Ukrainian riot police are taking up positions near Kiev's City Hall, where thousands of anti-government protesters have massed. 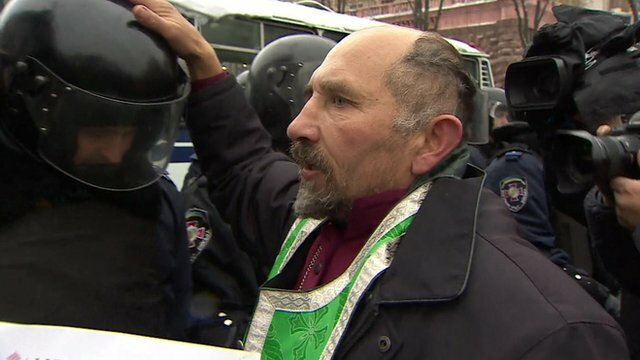 More police are being bussed in, the BBC's Steve Rosenberg says, with priests urging them not to use force. The tense stand-off follows weeks of demonstrations after a government U-turn on a free trade deal with the EU. President Viktor Yanukovych said a he would hold talks involving the opposition on Tuesday. The opposition is sticking to its demand for the replacement of what amounts to the entire ruling structure: the president, parliament and cabinet. Catherine Ashton, the EU foreign policy head, will have her work cut out when she arrives in Kiev to try to defuse the situation. A statement on the president's website said Mr Yanukovych would hold talks with three of his predecessors on Tuesday to try to find a compromise. The protesters have given Mr Yanukovych 48 hours to dismiss the government and are demanding new elections for the presidency and government. They have condemned Mr Yanukovych for refusing to sign an association agreement with the EU last month. He said he shelved it because it would put trade with Russia at risk. Protesters are blockading government buildings with cars, barricades and tents. EU foreign policy chief Catherine Ashton will be in Ukraine on Tuesday and Wednesday "to support a way out of the political crisis". President of the European Commission, Jose Manuel Barroso, said in a statement that he had spoken to Mr Yanukovych over the telephone and asked him "to show restraint". He said he had asked him "to not use force against the people that are demonstrating peacefully, to respect fully the freedoms that are so important for all of us in Europe". Baroness Ashton will hold talks with government officials, opposition activists and civil society groups. The Commission says the EU's offer of an association agreement with Ukraine remains on the table, provided Ukraine meets the conditions - and they cannot be renegotiated. One key condition is the release of opposition leader Yulia Tymoshenko, jailed in 2011 over a controversial gas contract with Russia. Ukraine's relationship with Vladimir Lenin is complicated. He is still widely seen as a symbol of the Soviet occupation. He was the one who brought the nation back into the Kremlin's fold after its short-lived independence following the collapse of the Russian Empire in 1917. A bloody Red Army operation resulted in the capture of two-thirds of Ukraine. A campaign of forced food requisitions - part of Lenin's "crusade for bread" - starved thousands of Ukrainians. But Lenin also helped make Ukraine the industrial powerhouse it is today. His government approved Ukraine's first major hydropower plant on the Dnieper river at Zaporizhya. That, in turn, spawned a number of huge steel-making and chemical factories. Hundreds of thousands of people took part in Sunday's protest - the biggest so far in nearly three weeks of opposition demonstrations in Kiev. 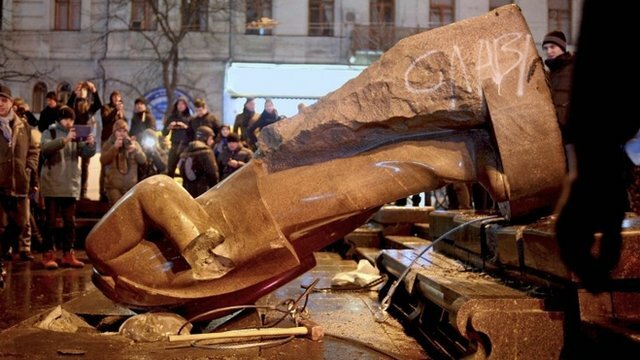 During the evening, a group of protesters smashed the city's statue of the Russian revolutionary leader Lenin, and brought its dismembered parts as trophies to Independence Square. The statue stood at the top of Shevchenko Boulevard, and was toppled with metal bars and ropes, then smashed up with hammers. No arrests were reported in the incident. These are the biggest street protests in Ukraine since the 2004 Orange Revolution, which swept pro-Western leaders to power, though Mr Yanukovych made a comeback in 2010. Many of the protesters suspect Russia's President Vladimir Putin of trying to model a new Russian-led customs union on the Soviet Union. So far only Belarus and Kazakhstan have joined it. The party of Ms Tymoshenko, a former prime minister, has urged people to "chase" the president "until he falls". Meanwhile the Ukrainian Security Service said it was investigating some politicians on suspicion of what it called "actions aimed at seizing state power". It did not name the politicians. Are you in Kiev? Are you attending the protest? Send us your comments using the form below. Send your pictures and videos to yourpics@bbc.co.uk or text them to 61124 (UK) or +44 7624 800 100 (International). If you have a large file you can upload here. Hundreds of riot police squared off against anti-government protesters in Kiev city centre as fears grew of an imminent brutal crackdown on dissent. The Ukrainian capital was brought to a standstill for a third week by rebels angered by President Viktor Yanukovych's decision to shelve a treaty with the European Union in order to focus on ties with Moscow. Protesters, armed with improvised weapons, have refused to leave Kiev's city hall and are preparing for a full assault by police. 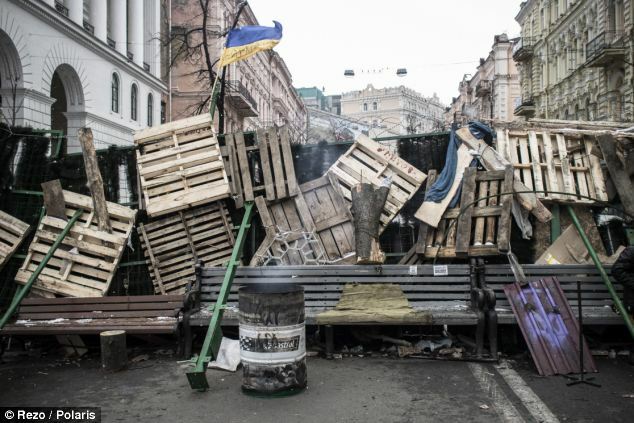 They set up makeshift barricades in the streets to hold off any advances by security forces. The protesters have been galvanised after police violently dispersed some of the demonstrators. Sunday's demonstration by hundreds of thousands was the largest since the 2004 pro-democracy Orange Revolution protests that annulled Mr Yanukovych's presidential victory due to voting fraud. In a surprise move, Mr Yanukovych announced that he would meet three former Ukrainian presidents on Tuesday to discuss a way out of the crisis that has paralysed the country. The European Union's foreign policy chief, Catherine Ashton, was heading to Ukraine to help defuse the tensions. The political stand-off has been aggravated by Ukraine's deteriorating finances. The economy has been in recession for more than a year, and the government is in desperate need of foreign funding to avoid a default. As talks stalled with the International Monetary Fund, Mr Yanukovych has sought a bailout loan from Russia. 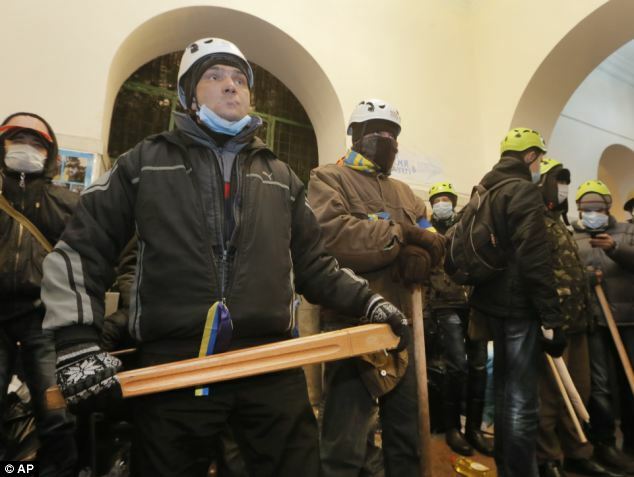 Wearing helmets and holding shields, Ukrainian police took up positions outside Kiev's city hall after a deadline was set by a court for the protesters occupying the building to leave. Police have also blocked the entrances to nearby Independence Square, known as the Maidan, which has been the heart of the protests. At the square, black-robed Orthodox priests sang solemn prayers calling for peace amid heavy snowfall. Some protesters left the city building, fearing a violent police raid, but dozens of more radical activists barricaded themselves inside. They were armed with planks, metal rods and bottles of sunflower oil, hoping to make riot police slip if they advanced. Opposition leader Arseniy Yatsenyuk called for calm, telling several thousand protesters on Independence Square that police were ordered not to storm the building but to blockade the protest camp to deplete it of food and other amenities. 'I am turning to all Ukrainians: You must all go to the heart of the Maidan,' he said. Some activists approached police lines, urging officers to come over to their side and even offering them food. As tensions mounted, Mr Yanukovych announced he would meet Ukraine's three former presidents to discuss the situation. But at the same time, prosecutors called in several opposition leaders for questioning. EU Commission President Jose Manuel Barroso dispatched EU foreign policy chief Lady Ashton to Kiev, saying she will try to help defuse 'the very tense solution that Ukraine is living today'. Political analyst Volodymyr Fesenko said the deployment of troops to Kiev appeared to be a show of force, but that a crackdown was still possible. 'For now they are trying to scare Maidan and Kiev residents, but the risk of a forceful storming remains high,' he said. The protests that erupted on November 21 have had an anti-Russian bent because Moscow worked hard to derail the Ukraine-EU deal, issuing threats of trade consequences if Ukraine went through with it. On Sunday, hundreds of thousands of protesters calling for Mr Yanukovych's removal poured into Kiev, toppling a statue of former Soviet leader Lenin and blockading government buildings. As anger spread across the country, protesters vandalised another Lenin statue in the southern town of Kotovsk. Riot police encircled central Kiev on Monday night, raising fears the authorities were preparing a crackdown on anti-government protesters just hours after Ukraine’s president said he was prepared to hold talks with opposition leaders. The ominous police build-up came as the EU’s foreign policy chief Catherine Ashton was preparing to fly into Kiev on Tuesday for talks with president Viktor Yanukovich. Vitali Klitschko, the heavyweight boxer-turned-opposition leader, warned that any move to clear protesters from the streets would be a sign that Mr Yanukovich was setting up a “police state”. Hundreds of riot police appeared to have surrounded the whole of the city centre, though they remained a short distance away from Independence Square, epicentre of the protests where thousands of demonstrators have camped out. But three metro stations around the square were closed, and shopping malls above and below the square closed down operations early for the first time since protests began 19 days ago. Elsewhere in the city, masked men with machine guns late on Monday raided the headquarters of the Fatherland party of jailed opposition leader Yulia Tymoshenko, taking away computer servers, with one person present calling the scene “insane”. Some opposition party and independent newspaper websites were also blocked. Busloads of riot police were beginning to tear down barricades set up by protesters near government buildings in the capital, and were reported to have surrounded a group of demonstrators outside the presidential administration building. In a possible precursor to action by law-enforcement authorities, Ukraine’s prosecutor-general Viktor Pshonka warned in a statement that the protests had turned into “blatant aggression” and were preventing government bodies from operating normally. “Do not test the patience of government. Do not provoke law enforcement. Lift the blockades of premises and of transport,” the statement said. The moves came after hundreds of thousands of Ukrainians flocked to Kiev on Sunday in the biggest demonstration since the current protests began – and the largest since Ukraine’s 2004 pro-democracy “Orange” revolution. Protesters are angry over Mr Yanukovich’s decision to back away from signing a landmark integration deal with the EU in favour of stronger ties with Russia, and over the brutal dispersal of a small tented protest nine days ago. As night fell on Monday, Mr Klitschko told the Financial Times he planned to stay on the streets through the night to ensure protesters’ safety. “If Yanukovich storms the protesters tonight, on the eve of [Lady] Ashton’s visit, then it is a sign that he has chosen to turn the country into a police state,” he warned. Standing by protesters’ barricades outside Ukraine’s interior ministry, Mr Klitschko said he was prepared to hold talks with Mr Yanukovich – but only if the government released several demonstrators arrested in the past week. In the first hint of any potential compromise, Ukraine’s president earlier said he backed a proposal by Leonid Kravchuk, the country’s first post-Soviet president, for an “all-national round table” with government and opposition representatives. But his comments appeared at odds with events unfolding on Kiev’s streets, with authorities seeming intent on clearing protesters from at least some parts of the city. Analysts warned that with military veterans, including former members of Soviet occupying forces in Afghanistan, among the protesters, any attempt at a clampdown could spark widespread bloodshed. It could also leave Mr Yanukovich ostracised by the international community, and utterly reliant on Russia. Ukraine’s president turned his back on a landmark integration deal with the EU nearly three weeks ago in favour of strengthening ties with Moscow – sparking the protests. But people who know him say Mr Yanukovich fears Vladimir Putin and is wary of being left with the Russian president as his only ally. Earlier on Monday, José Manuel Barroso, European Commission president, reiterated his warning to Mr Yanukovich to “show restraint” and “not use force against people that are demonstrating peacefully”. Mr Barroso appeared to put himself on the side of the anti-Yanukovich protesters, saying they were “fighting for Ukraine and for their future” and comparing them to earlier advocates of EU membership in Poland and the Baltic states. “When we see in the cold streets of Kiev men and women with the European flag, fighting for that European flag, it is because they are also fighting for Ukraine and for their future,” Mr Barroso said. Ukrainian president Viktor Yanukovich backed a call for talks with the opposition today to end weeks of protests in Kiev, but tension was high with pro-Europe demonstrators barricading their protest camp in preparation for police intervention. As riot police took up new positions in the capital, heavyweight boxing champion-turned-opposition politician Vitaly Klitschko called on the protesters to stand their ground, and warned Mr Yanukovich that he would have blood on his hands if security forces tried to end the stand off violently. Mr Klitschko later tweeted that some protest barricades were being taken down by police in a southern part of the city. Across town, police dismantled protest tents to free the main road near the government hq and herded protesters back. But no clashes were reported. Reports say there were no attempts by police to move against the large encampment of protesters on Kiev’s Independence Square, focal point of the demonstration. Masked men with guns raided the party headquarters of jailed opposition leader Yulia Tymoshenko and took a computer server, said a spokeswoman who blamed the authorities. With pressure growing on a shaky economy, the presidential website said Mr Yanukovich supported a proposal for round-table talks involving the authorities and the opposition as a possible “platform for mutual understanding”, the website said. No date was given for when the reconciliation talks could be held. Nor was it clear what the united opposition’s reaction to Mr Yanukovich’s proposal would be. But it was the first real sign by Mr Yanukovich - whose switch in trade policy away from the European Union towards Russia on November 21st provoked the unrest - that he might be ready to listen to opposition demands for the resignation of his government and early elections. Despite his words, tension rose sharply on the streets after riot police units moved to take up their positions at potential flashpoints. Demonstrators, responding to calls from opposition leaders, threw up new blocks in streets blanketed by snow after a heavy fall overnight to seal off their main protest camp on Independence Square. “We call on people to stand their ground, and peacefully, without using force or aggression, to defend their right to live in a free country,” Mr Klitschko, who is increasingly being seen as a national leader-in-waiting, said. “We are expecting the break-up by police of peaceful demonstrators. If blood is spilled during this dispersing (of protesters), this blood will be on the hands of the person who ordered it - ... Yanukovich,” he said. State prosecutor Viktor Pshonka issued a tough warning to the demonstrators to end their blockade of road access to the presidential headquarters and government offices. The protesters have been inflamed by a police crackdown on November 30th. European Commission president Jose Manuel Barroso, who spoke to Mr Yanukovich by phone yesterday, led Western calls today for authorities not to react violently. “Those young people in the streets of Ukraine in freezing temperatures are writing the new narrative for Europe,” he said in Milan. “I’ve asked him (Yanukovich) to show restraint in the face of these recent developments, not to use force against people who are demonstrating peacefully, to respect fully their freedom.” EU foreign policy chief Catherine Ashton expects to meet Yanukovich and opposition leaders when she visits Kiev tomorow and Wednesday. Mr Yanukovich’s sudden turn towards Russia has provoked the biggest street protests since the 2004-5 Orange Revolution, when people power forced a re-run of a fraud-tainted election and thwarted his first run for the presidency. On Sunday, several hundred thousand people turned out on Independence Square - focal point of the “orange” protests - calling for the government’s resignation and early elections. The rally, which ended with a crowd toppling a statue of Soviet state founder Vladimir Lenin, followed talks on Friday between Yanukovich and Russian President Vladimir Putin. Neither side has yet given a detailed account of what was agreed at these talks, though Ukrainian prime minister Mykola Azarov said a “big agreement” had been reached. Though most people believe Putin may have offered credits and a cheaper price for gas in return for dumping an EU trade pact, the secrecy surrounding the talks have only fuelled opposition suspicions that Yanukovich might be readying to take Ukraine into a Moscow-led customs union. 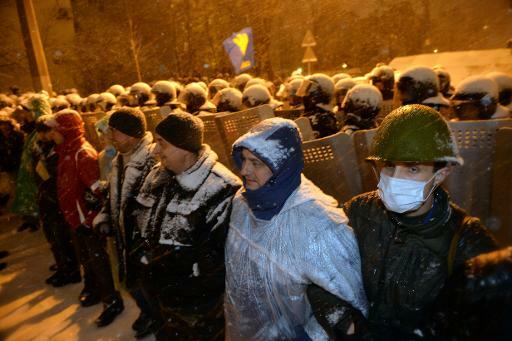 Protesters speak to riot police lined up near of the presidential office in Kiev. Ukrainian President Viktor Yanukovych has offered talks with the opposition amid growing fears that the so far peaceful anti-government protests might turn violent. It was the first time that Yanukovych had shown any sign of compromise in the more than two weeks of protests, the largest since Ukraine’s so-called “Orange Revolution” of 2004 and 2005. But opposition leaders retorted by setting conditions for the talks – such as calling early elections – and vowed to defend the centre of Kiev after riot police moved into the capital, where thousands of protesters have set up camp and barricades. By the afternoon the police had started to disband some of the barricades. They re-opened access to the cabinet of ministers’ building, which had been blocked by protesters. Earlier, Arseny Yatsenyuk, the leader of the Fatherland party of jailed former prime minister Yulia Tymoshenko, said that the opposition will hold on to the city’s Independence Square, known as Maidan in Ukrainian. On Sunday, some 200,000 people gathered in the square to demand the government’s resignation, making it one of the largest demonstrations in the country’s stormy post-Soviet history. Hundreds of activists braved freezing temperatures and spent the night on the square. Yesterday small groups of protesters were huddling under barricades, which included razor wire, cars and at least one lorry and a small bus. The interior ministry had warned protesters that they risked criminal persecution if they broke the law. Police also closed key subway stations in the city centre, citing a bomb threat. World heavyweight boxing champion Vitaly Klitschko and his brother, Vladimir, offered their support during a visit to the square. “We are doing this so that President Yanukovych finally hears our demands,” Vitaly Klitschko said. His party, UDAR (Punch) – the smaller opposition faction in parliament – called supporters to come to the square. “We call on people to stand their ground, and peacefully, without using force or aggression, to defend their right to live in a free country,” Vitaly Klitschko, who is increasingly being seen as a national leader-in-waiting, told Reuters. “We are expecting the break-up by police of peaceful demonstrators. If blood is spilled during this dispersing (of protesters), this blood will be on the hands of the person who ordered it – Yanukovych,” he added. Yanukovych later said in a statement that he supported a proposal by former president Leonid Kravchuk, saying it “can become a platform for understanding”. Kravchuk was Ukraine’s first post-Soviet president from 1991 to 1994. According to Kravchuk’s proposal, Yanukovych would meet his three predecessors – Kravchu, Leonid Kuchma and Viktor Yushchenko – today to discuss the country’s most important issues. Fear of a crackdown were fueled by new reports of arrests among protesters. And Yatsenyuk said that he had been called for questioning by police. Meanwhile, masked men with guns raided the Kiev party headquarters of Ukraine’s jailed opposition leader Yulia Tymoshenko and took a computer server yesterday, spokeswoman Natalia Lysova said. Lysova blamed police for the raid, but the police denied any involvement. Online newspaper Ukrainska Pravda said the raid was the work of the SBU state security service, which was unavailable for comment. Yuri Lutsenko, a former interior minister under Tymoshenko, said in a newspaper interview that the opposition had to choose between two options – “prison or victory”. The protests were triggered by Yanukovych’s decision not to sign a landmark association and trade agreement with the European Union and to seek closer ties with Russia instead. European Commission President Jose Manuel Barroso, who spoke to Yanukovych by phone on Sunday, led Western calls yesterday for authorities not to react violently. “Those young people in the streets of Ukraine in freezing temperatures are writing the new narrative for Europe,” he said in Milan. The EU has said its foreign policy chief, Catherine Ashton, will try to defuse the situation during two days of talks beginning today. Ashton plans to meet the main stakeholders in government, the opposition and in civil society, her spokeswoman, Maja Kocijancic, said. The EU’s neighbourhood policy commissioner, Stefan Fule, expressed hope that Ukraine would find a “consensus” to resume progress towards closer ties with the EU. “[The] association agreement is on the table and we are ready to sign it when the Ukrainian side is ready to sign,” the commissioner said. Italian Foreign Minister Emma Bonino said that Ashton’s mission should seek to calm an already explosive situation. “Ukraine needs everything but a descent into civil war. This is exactly why [it was agreed to send] Ashton to Kiev,” Bonino told reporters in Rome. Lithuanian Foreign Minister Linas Linkevicius, whose country holds the EU’s rotating presidency, called on Ukraine to “show some signals, not just words, but also to show that we really can rebuild trust”. (Kiev, UKR) - Ukrainian security forces on Monday moved in on pro-EU demonstrators to end a week-long blockade of the government headquarters after the authorities sent special internal troops into central Kiev in an increasingly tense showdown. With the authorities apparently keen to regain control of the city centre, the party of jailed opposition leader Yulia Tymoshenko said that armed police had raided their offices although this was denied by police. Upping the stakes after more than a fortnight of protests over the government's rejection of a pact with the European Union, the protesters a day earlier symbolically toppled the statue of the Soviet Union's founder Vladimir Lenin in Kiev. President Viktor Yanukovych announced he would meet former Ukrainian presidents on Tuesday in a bid to find a way out of the crisis and was also backing the idea of roundtable talks with the opposition. With international concern growing about the risk of tensions degenerating into violence, EU foreign policy chief Catherine Ashton was to travel to Kiev Tuesday for talks with Yanukovych. Ukrainian police on Monday forced protesters who have blockaded the government headquarters in central Kiev for a week to move away from the building, an AFP correspondent said. A column of special troops moved in on the protestors to force them to leave, upon which opposition MPs urged the demonstrators to move down the street to Independence Square, the main protest venue. Communal service workers -- helped by police -- then started dismantling the barricades the protesters had erected around the cabinet headquarters. The website of the Zerkalo Nedeli weekly said that Yanukovych on Monday had held a special meeting of his top security officials and ministers at his out-of-town residence where it was decided to restore order in central Kiev. Dozens of interior ministry troops and anti-riot police had earlier been sent into central Kiev and could be seen moving in columns through the streets. "We are now going to defend our Maidan," said opposition leader Arseniy Yatsenyuk, referring to Kiev's Independence Square by its Ukrainian name. The leader of the UDAR (Punch) opposition party and former world boxing champion Vitali Klitschko urged people to head en masse to Independence Square. "It is impossible now to make a step backwards," said protestor Volodymyr Kiblyk from the central town of Znamenka who has been at the Kiev protests for two weeks. A presidential statement said Yanukovych backed an initiative for talks proposed by Ukraine's first ex-Soviet president Leonid Kravchuk. He will also meet with Kravchuk and two other former leaders Leonid Kuchma and Viktor Yushchenko on Tuesday, it said. Hundreds of thousands had on Sunday filled Independence Square to bursting point to denounce Yanukovych's rejection of an EU pact under Kremlin pressure, in the biggest protests since the 2004 Orange Revolution. In a hugely symbolic denouement to the rally, dozens of masked protesters, some brandishing flags of the ultra-nationalist Svoboda (Freedom) party, tore down a 3.4 metre (11 feet) high statue of Lenin after putting a rope noose round his neck. Police opened a criminal probe into "mass riots" over the felling of the monument but said Monday that so far no-one has been arrested over the incident. Protesters have seized control of Independence Square for over a week, setting up a tent city. The protesters have also occupied Kiev city hall with dozens again sleeping there overnight on Sunday. Ukraine's Security Service (SBU) said it had opened an investigation into alleged attempts by politicians to seize power, in an apparent bid by the state to target key opposition figures. The size of Sunday's protest, the third mass rally in successive weekends, increased the pressure on Yanukovych who further galvanised his opponents by meeting Russian President Vladimir Putin in almost total secrecy on Friday. Analysts believe Russia may have offered Ukraine cheaper gas and billions of dollars in aid in exchange for joining the Customs Union at Yanukovych's closed-door meeting with Putin on Friday in Sochi. 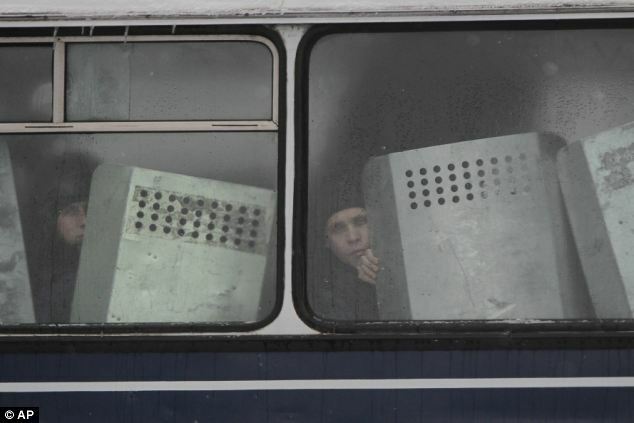 Riot police officers leave their bus to block Pro-European Union activists gathered at the Independence Square in KIev, Ukraine, Monday, Dec. 9, 2013. 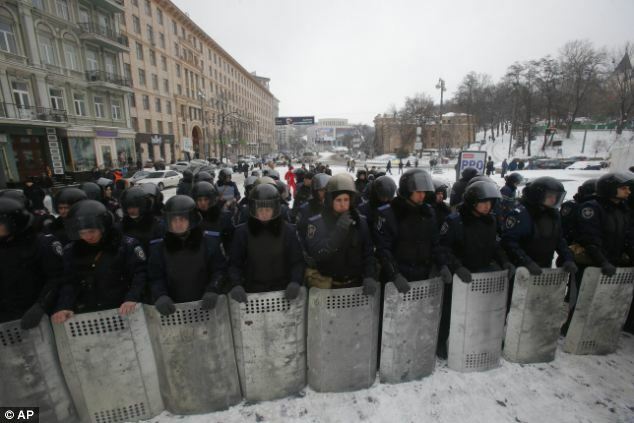 The policemen, wearing helmets and holding shields, formed a chain across Kiev’s main street outside the city building. Organizers called on protesters to vacate the city hall and the other building which the opposition had used as its headquarters. 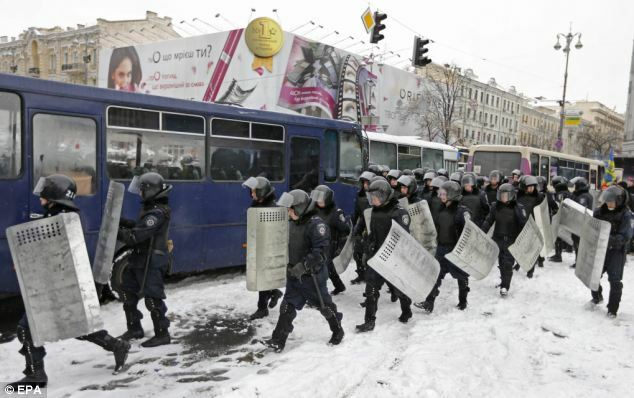 KIEV, Ukraine (AP) — Heavily armed riot troops broke into the offices of a top Ukrainian opposition party office in Kiev and seized its servers Monday, the party said, as anti-government protests crippled the capital for yet another day. Elsewhere police dismantled or blocked off several small protest tent camps that near key national government buildings in the city. Tensions also rose as a double cordon of helmeted, shield-holding police deployed in the street near Kiev's city administration building, which demonstrators had occupied and turned into a makeshift command post and dormitory. The moves came a day after hundreds of thousands of demonstrators crammed into Kiev, the biggest in three weeks of protests that started when Ukraine's president backed away from signing a long -awaited pact to deepen ties with the 28-nation European Union. Protesters are angered not only by the thwarting of their desire to become closer to the West and spin out of Russia's orbit, but by police violence against the demonstrators. Club-swinging police have twice broken up protest rallies. Ostap Semerak, a member of the Fatherland Parry, told The Associated Press that troops broke into the party's offices on Monday evening, some climbing in through its windows. "They are storming us. The images are insane," he said by telephone. The troops left after confiscating some computer equipment, he said. An Associated Press reporter later saw broken glass and smashed computers in the offices. Party member Marina Soroka also said the troops surrounded and blockaded several opposition-minded Ukrainian media outlets, making their and other media websites inaccessible. The party is headed by imprisoned former prime Yulia Tymoshenko, a longstanding foe of President Viktor Yanukovych, and is the largest opposition grouping in the parliament. Critics say Tymoshenko's conviction on abuse of office charges was a case of political revenge. In a surprise move, Yanukovych announced he would sit down with three former Ukrainian presidents on Tuesday to discuss a way out of the crisis that has paralyzed the country. The European Union's foreign policy chief, Catherine Ashton, was also heading to Ukraine to help defuse the tensions. Ukraine's political standoff has been aggravated by its rapidly deteriorating finances. The economy has been in recession for more than a year, and the government is in desperate need of foreign funding to avoid a default. As talks stalled with the International Monetary Fund, Yanukovych has sought a bailout loan from Russia. This former Soviet republic of 46 million people is sharply divided over the prospects of drawing closer to its powerful neighbor, Russia. Yanukovych's stronghold, is dominated by Russian speakers who want closer ties to Russia, in contrast to Kiev's students and residents in the west who see better EU ties as the way forward. Opinion polls, however, show that the EU is more popular among Ukrainians than Russia. Wearing helmets and holding shields, Ukrainian police surrounded three tent encampments outside the government and presidential offices in central Kiev on Monday night. Riot police also began removing barricades on the approach to the government building. Most protesters remained standing. World boxing champion and opposition leader Vitali Klitschko warned the authorities against any further escalation in tensions. "We are calling upon law enforcement to restrain from using force against peaceful demonstrators," he said as he tried to stop police from removing the tents. A large protest test camp remained in place on Independence Square, the downtown plaza that is the epicenter of the protests. The square is a few hundred meters from the protester-occupied city administration building, which a court has ordered demonstrators to vacate by Monday. The appearance of riot police nearby raised anxieties inside, and some of the hundreds of people inside left. But hundreds remained inside, armed with wood planks, metal rods and bottles of sunflower oil, hoping to make riot police slip if they advanced. "We won't let anybody into the building," said Vasyl Khlopotaruk, one of the activists. "But we hope there isn't bloodshed." As tensions mounted, Yanukovych announced on his website that he would meet with Ukraine's three former presidents to discuss the situation. But at the same time, prosecutors called in several opposition leaders for questioning. EU Commission President Jose Manuel Barroso dispatched EU foreign policy chief Ashton to Kiev on Tuesday, saying she will try to help defuse "the very tense solution that Ukraine is living today." Barroso praised the demonstrators, saying they are "writing the new narrative for Europe." U.S. Ambassador to Ukraine Geoffrey Pyatt cautioned the government against using force. "Peaceful demonstrations must be allowed to continue," he wrote on Twitter. "Dialogue and non-violence key, world watching. Opportunity must not be lost." The protests that erupted on Nov. 21 have had an anti-Russian bent because Moscow worked hard to derail the Ukraine-EU deal, issuing threats of trade consequences. On Sunday, hundreds of thousands of protesters calling for Yanukovych's ouster poured into Kiev, toppling a statue of former Soviet leader Vladimir Lenin and blockading government buildings. Protesters on Monday vandalized another Lenin statue in the southern town of Kotovsk. "Only the legs are left standing," town spokeswoman Yelena Khaustova told the AP. Washington (United States) — US Vice President Joe Biden on Monday conveyed Washington's "deep concern" to Ukrainian leader Viktor Yanukovych as tensions escalated in the country's political crisis. A White House statement said Biden had called Yanukovych and emphasized the "need to immediately de-escalate the situation and begin dialogue with opposition leaders." Biden's call came after Ukrainian security forces moved in on pro-EU demonstrators to end a week-long blockade of the government headquarters. Protestors have taken to the streets after Yanukovych refused to sign a European Union pact under pressure from Moscow. The White House statement said Biden had warned against violence. "He noted that violence has no place in a democratic society and is incompatible with our strategic relationship," the statement said. Viktor Yanukovych said on his website that the meeting, labelled “a nationwide roundtable” will take place on Tuesday. Ukraine’s president has agreed to meet with the country’s three former presidents to talk about defusing the tense political crisis gripping the country. Meanwhile, scores of riot police in full gear were deployed outside protest strongholds in Kiev, stoking fears of a crackdown. The demonstrators on Monday kept up their protest against Yanukovych after symbolically toppling the statue of the Soviet Union’s founder Vladimir Lenin during a gigantic rally in central Kiev. Hundreds of protesters braved early morning sub-freezing temperatures to maintain the open-ended demonstration on Independence Square in Kiev while others staffed barricades thrown up the day earlier around key buildings. “It is impossible now to make a step backwards,” said protester Volodymyr Kiblyk from the central town of Znamenka who has been at the Kiev protests for two weeks. Hundreds of thousands had on Sunday filled Independence Square to bursting point to denounce Yanukovych’s rejection of an EU pact under Kremlin pressure, in the biggest protests since the 2004 Orange Revolution. In a hugely symbolic denouement to the rally, dozens of masked protesters, some brandishing flags of the ultra-nationalist Svoboda (Freedom) party, tore down a 3.4 metre high statue of Lenin after putting a rope noose round his neck. They then hacked away with axes at the remnants of the monument lying flat on the ground. Parts of the statue including one of its hands were afterwards triumphantly brandished at the main demonstration on Independence Square. Police opened a criminal probe into “mass riots” over the felling of the monument but said on Monday that so far no-one has been arrested over the incident. Upping the stakes in the confrontation, demonstrators have erected one-and-a-half metre high barricades outside the seat of government, making it impossible for ministers to go to their offices by car. Jailed ex-premier Yulia Tymoshenko told Sunday’s rally the opposition was demanding the ‘immediate’ resignation of Yanukovych, in a no-holds-barred statement read by her daughter. UN Secretary-General Ban Ki-moon called Yanukovych by phone to urge for dialogue with his rivals as large-scale protests gripped Kiev, the UN said. Security forces backed off from the Ukrainian capital's main square after a failed effort overnight to end the protest that has left the country in its worst political crisis in nearly a decade. A young protester wearing a traditional Ukrainian wreath looks at the riot policemen standing in front of a barricade held in Kiev's Independence Square Wednesday. KIEV, Ukraine—Security forces pulled back Wednesday from the Ukrainian capital’s main square and government buildings after a failed effort overnight to end the weekslong protest that has left the country in its worst political crisis in nearly a decade. Riot police wearing black helmets and carrying shields had pushed through makeshift barricades early Wednesday and were met by hundreds of protesters, some wearing orange hard hats, who had hastily gathered to defend the encampment. While scuffles broke out between police and some demonstrators and opposition lawmakers, the security forces kept their clubs at their sides and didn’t resort to the violence seen during a crackdown on Nov. 30 that had served to strengthen the protests’ momentum. By mid-morning, the officers retreated from Independence Square, abandoning it to the thousands of protesters who remained gathered there, with the crowd appearing to be growing. A statement posted on the Ukrainian Interior Ministry’s website shortly after the police began to leave said that the protest would be allowed to continue. “I want to calm everyone down. There will be no dispersal of [protesters from the square]. Nobody is infringing upon the people’s right to a peaceful protest. However, the rights and legitimate interests of other people cannot be ignored. The capital city’s normal functioning cannot be disrupted,” Interior Minister Vitaly Zakharchenko was quoted in the statement as saying. The attempted crackdown, which came just hours after top western diplomats had met President Viktor Yanukovych to call for a nonviolent resolution to the crisis, had been met with international condemnation. The demonstrations began Nov. 21 after Mr. Yanukovych’s abrupt about-face on a plan to sign a partnership agreement with the EU. Instead, he called for closer ties with Russia, triggering the largest demonstrations in the country since the Orange Revolution in 2004. 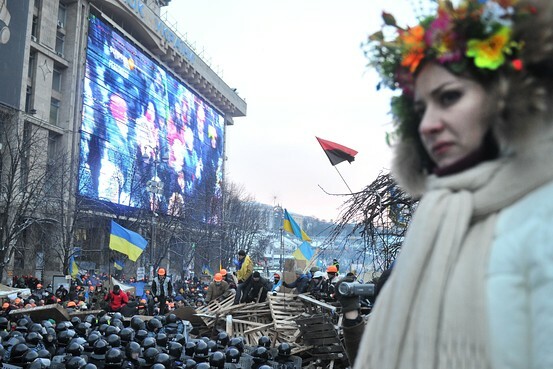 Hundreds of thousands of Ukrainians turned out calling for Mr. Yanukovych to step down. 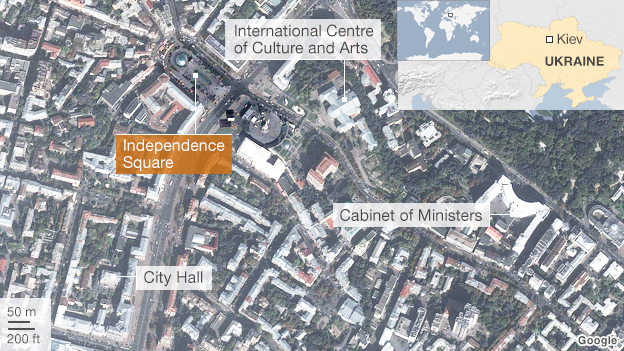 They occupied government buildings and set up an encampment on Independence Square. The storming of the square also came just hours after Mr. Yanukovych appeared for the first time to signal some concessions, though not enough to satisfy opponents. Mr. Yanukovych pledged to free some jailed demonstrators and to find a way to strengthen ties with the EU. But opposition leaders said Mr. Yanukovych’s concessions, made during a televised meeting Tuesday with three former presidents, were inadequate. The opposition insisted protesters would stay until Mr. Yanukovych fired his government and punished police who had beaten demonstrators in clashes more than a week ago. 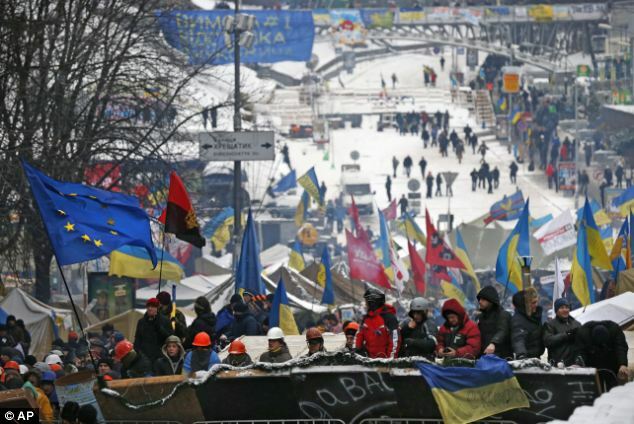 Opposition leader Arseniy Yatsenyuk sought to encourage the crowd early Wednesday, calling for new protests. “We will not forgive this. Here there will be millions and his regime is going to collapse,” Mr. Yatsenyuk, the leader of the party of jailed ex-premier Yulia Tymoshenko, told protesters on Independence Square. Later, Vitali Klichko, a former boxer who leads the Ukrainian Democratic Alliance for Reform party, made his way to the police line as the crowd chanted his name. Riot police briefly seemed to pause as he called on them to turn back. The political standoff, now in its third week, has pushed the cost of insuring Ukraine’s debt against default to highs for the year as investors grew increasingly nervous about the impact on Kiev’s precarious finances. Ukraine, which is in recession, needs around $18 billion in external financing in the next year to cover debt payments and its bill for natural gas from Russia. Ukrainian officials have rejected overhauls mandated by the International Monetary Fund, including raising household gas prices, as too painful for the country’s population. But a hoped-for deal with Russia for a discount on natural gas has yet to materialize. Signing any deal with Moscow would be incendiary, as protesters have demanded the country instead look to the West for support and sign a long-planned EU free-trade and political-association deal. Mr. Yanukovych said that he was discussing cheaper gas with Russia, but insisted his main aim was still to sign the proposed EU deal, perhaps as early as spring. He also repeated earlier comments that Ukraine would need compensation for losses he says it would incur in lost trade with Russia from signing the deal, and indicated he wanted to renegotiate it. European officials have ruled out renegotiating the deal, which they had hoped to sign last month, but say it remains on the table. The first hint of a compromise came when Mr. Yanukovych said some of the protesters could be released from detention. On the square before the riot police moved in, the mood was resolute. Many said the president hadn’t gone far enough. “We’re prepared to stay until the end. Until he fulfills our demands,” said Volodymyr Lapa, who is 33 years old. –Katya Gorchinskaya in Kiev and Ben Edwards in London contributed to this article.